The Resolution Project: For my New Year’s resolution this year (that being 2011), I decided to try and read all one hundred of the novels picked by Time Magazine as the best since their inception in 1923 to the list’s publication in 2005. I exempted myself from reading ones I’ve already read, leaving some eighty-six or so to read before the end of this year. Some spoilers may lie ahead, so be warned if you’re the type to be bothered by that. John Singer is a deaf-mute man living in a mill town in the American South during the Great Depression. After his friend, a fellow deaf-mute named Antonapoulos, is committed to an asylum, Singer somehow becomes the focal point for people in the town to tell all of their sorrows to. They include; Biff Brannon, owner of the New York Cafe and married to a sickly woman; Mick Kelly, a girl from a poor family who is obsessed with one day composing a great symphony; Jake Blount, an alcoholic would-be Communist turned carnival attendant; and Doctor Copeland, an African-American doctor who bemoans the plight of his impoverished people. This was a pretty solid book, which illustrates the dangers of turning someone you know (or at least think you know) into a sort of Christ-figure who you feel could absolve you of all of your sins. Like many of you, I’d first heard the phrase “the heart is a lonely hunter” from the song by Reba McEntire, who, with the rest of her pop-country ilk, was on the radio any time my father drove somewhere when I was younger. After listening to it again, there isn’t much that the two have in common, other than acknowledging a desperate longing that dwells deep within the bowels of the human soul. For McEntire, this takes the form of a woman seeking out a one-night stand; for McCullers the hunger is more complex. All of “the people” who talk at Singer (I say at, because you’re never really too sure how much he’s listening, but at least he looks like he is, right?) are basically using him like a psychotherapist performing Freud’s talking cure. Unfortunately, all of their problems are way too big to be solved in this manner, they’ve all got to do with the abject poverty and predation that were omnipresent in the South at this time. 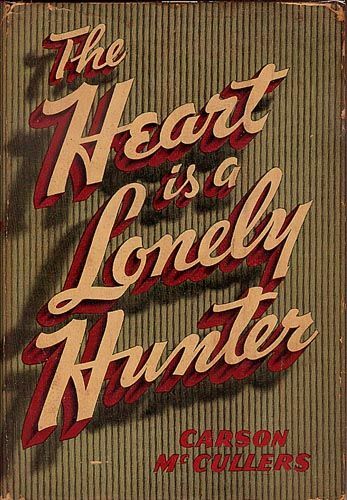 The Heart is a Lonely Hunter is a good companion piece to The Grapes of Wrath in this way, approaching the grand themes of that novel, but in a somehow gentler way. I must say that the Time 100 list is definitely well stocked with tales of Southern tragedy; in fact that’s probably the biggest theme to be found on the list in my reading so far. If the intention of the list’s creators is to make me feel sympathy for Southern people down on their luck, consider that accomplished, I guess, but it’s starting to get a little old to me. Who would I recommend this book to? : People who want to explore how human beings interact with each other in reality and in our own heads. People who are not sick of reading books about Southerners who are sad. Total pages read since January 1st: 13604 pp. Total books on the Time 100 list read: 48/113, or 42% complete.